The news surrounding the negotiations on the North Korean peninsula continues to appear promising, with all the parties involved remaining relatively optimistic. Important words coming from Pyongyang have been heard in recent weeks. The North Korean leadership has recently established some guidelines regarding internal social and economic development over the coming years. Once complete nuclear deterrence has been achieved, the objective then becomes the development of the economy and an improvement in the material wellbeing of North Koreans. The renunciation of its nuclear status is part of a broader plan that brings with it some essential requirements, such as the reunification of the two Koreas, a peace treaty with the United States, and the withdrawal of foreign troops from the peninsula. The possibility of achieving economic wellbeing for North Koreans is subject to the success of meeting these requirements. 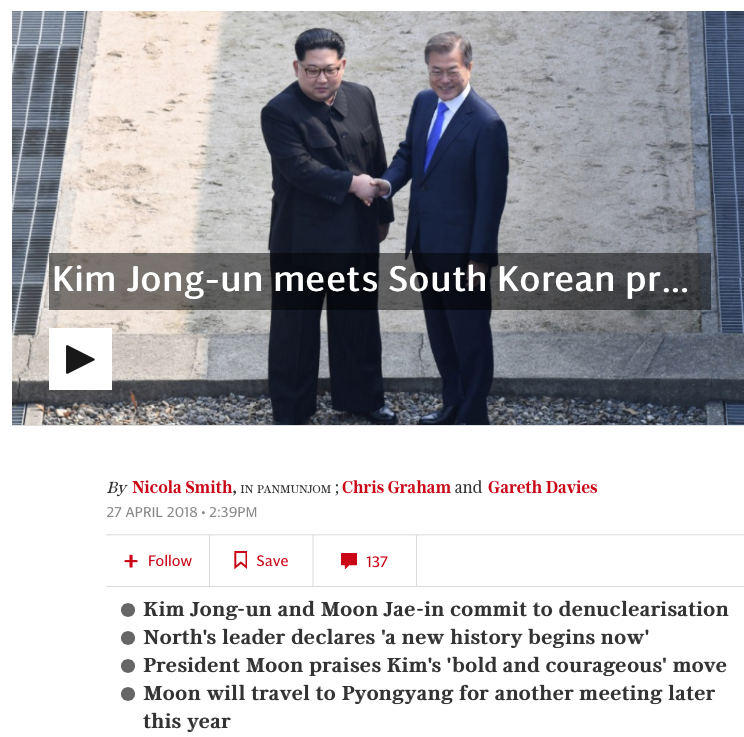 In this sense, the April 27 meeting between Moon Jae-in (President of South Korea) and Kim Jong-un opens up new possibilities, given the good will of the leadership of both countries to resolve their long-standing problems. Proceeding according to the timeline presented above, the meeting between the two leaders should pave the way for the much more critical meeting between Donald Trump and Kim Jong-un in a place yet to be decided, but one which would have high symbolic value. Avoiding excessive optimism, despite the obvious improvements in tone, rhetoric and actions compared to a year ago, the overall US strategy in the region should be considered. We have learned in recent months that the incumbent of the Oval Office has little influence over the dictates of the foreign-policy establishment, the deep state — call it what you like. This is a toxic concoction of industrialists, politicians, think-tank experts, former politicians, soldiers, and philanthropists dedicated solely to the preservation of the role of American primacy, with aspirations to global hegemony, dictated by the (wrong) belief that America is an exceptional country (see parts 1, 2, 3, and 4). In this sense, as highlighted by the Nuclear Posture Review, Washington has to deal with two peer competitors (China and Russia) and two minor opponents (Iran and North Korea) and plans its actions in the long term. The US troops stationed in South Korea reflect the desire of policy-makers to surround the Heartland and its periphery to contain the two powers that occupy this geographical space: Russia and China. The presence of American troops in South Korea is part of this geostrategic project and is viewed by Washington as crucial to the balance of power. All of these factors, in addition to the need to keep the flow of South Korean money into the coffers to US defense companies, indicate how the talks initiated by DPRK, South Korea and the United States are anything but straightforward. Observing the general picture of the region and the recent news released by Pyongyang, the question arises as to whether North Korea possibly pursued its nuclear-weapons program only in order to renounce it for the purposes of gaining important concessions from the Americans in the process? Regardless, obtaining a nuclear deterrent has its own inherent logic, in light of the danger posed by Washington and its aggressive imperialist foreign policy. But as we know, the real deterrent against any American invasion of the peninsula, or a decapitating first-strike against Pyongyang’s leadership, lies in North Korea’s possession of a huge and impressive conventional arsenal that is lined up along the demilitarized zone (DMZ). I pointed out in my previous article how the consequences of a war on the peninsula, even when not involving nuclear weapons, would represent a red line that could not possibly be crossed. The firepower directed against the forces stationed in South Korea by the DPRK would oblige the US to enter into a total war with the North, bringing about an irreparable crisis with Seoul, which would see hundreds of non-interceptable missiles launched against its city and troops. The obvious consequence would be a diplomatic break between South Korea and the United States, since Seoul would be forced to surrender/negotiate with the North. This would result in a disaster for US policy-makers, who use the Korean peninsula to station troops and military equipment (such as THAAD) as a launchpad for containing China. Realistically, however, what appears to be emerging is very similar to a strategy cleverly developed by the North Korean leadership over a number of years. As Pyongyang needed to bring the United States to the negotiating table, while at the same time guaranteeing its survival, it pursued its nuclear-weapons program. 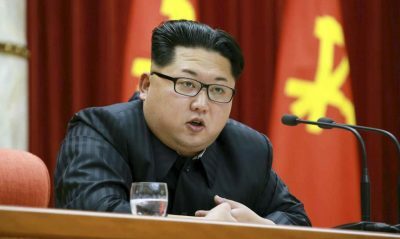 Since Washington seems to have understood that a military solution is not practicable, especially given the pressure brought to bear by its allies all too cognizant of a nuclear-armed DPRK, Pyongyang is now willing to display its good will, deciding to surprise the world by embarking on negotiations, with the renunciation of its nuclear weapons as a major bargaining chip. Under these conditions, Pyongyang is willing to cooperate, and South Korea welcomes the initiative with open arms, accelerating the meeting between the two leaders and paving the way for peace on the peninsula. The People’s Republic of China applauds the diplomatic efforts and encourages South Korea, and later America, in these diplomatic efforts. Seoul, Beijing and Pyongyang have every interest in reaching an all-encompassing deal, with or without Washington. The diplomatic ability of this trio has managed to leave the United States with its back against the wall, first of all obliging it to sit down at the negotiating table (something already revolutionary for reasons explained above), and then requiring it to ease sanctions considerably. Otherwise, North Korea would be seen as the party that is willing to achieve peace, while Washington is left isolated and looking like the warmonger. North Korea finds itself in a win-win situation. If sanctions are eased and peace talks are managed in the right manner, then the process of socio-economic rebirth, which Kim Jong-un considers a priority, can begin. Should the rhetoric of war prevail in Washington, then Washington would find itself at odds with its main ally, Seoul. It is likely that China could even justifiably renounce its sanctions against the DPRK, blaming the US for not making any progress in the face of extraordinary offers by Kim Jong-un to renounce his nuclear weapons. Washington would come across as the uncooperative party, and this would free the relevant parties, including allies, from taking the United States into consideration. Beijing would easily take the place of Washington as a mediator between North and South Korea, starting tripartite talks, taking into account everyone’s interests but Washington’s. The focus of the United States will be on achieving the least negative outcome for itself, given that it knows it has one of the weakest hands to play at the negotiating table. Federico Pieraccini is an independent freelance writer specialized in international affairs, conflicts, politics and strategies. He is a frequent contributor to Global Research.